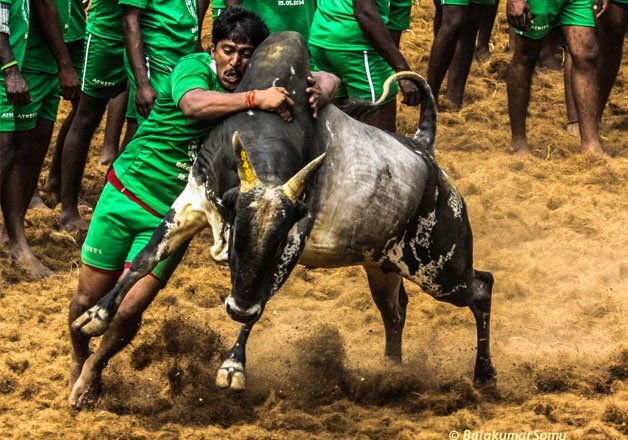 The Supreme Court stayed the Central Government’s notification, which permitted the controversial bull-taming sport ‘Jallikattu’ in Tamil Nadu as part of Pongal celebrations on Mattu Pongal day. Decision in this regard were taken by a SC bench comprising justices Dipak Misra and N V Raman after petitions were filed by Animal Welfare Board and People for the Ethical Treatment of Animals (Peta) India demanding that the Centre's recent notification allowing Jallikattu and bullock cart races should be stayed. On 8th January 2016, Ministry of Environment and Forests (MoEF) issued a notification lifting the four-year-old ban on holding of Jallikattu ahead of the Pongal festival along with Bullock cart races in Maharashtra. The notification allowed the exhibition or training of bulls and some other animals, as performing animals by following the traditional customs as a part of culture but it added some guidelines to regulate these sports involving animals as performing animals. The notification issued by the MoEF was against the Supreme Court’s 2014 ruling which had completely banned use of bulls for Jallikattu (also bull fighting) events or bullock-cart races across the country. Jallikattu is an ancient bull taming ritual in Tamil Nadu as part of Pongal celebrations on Mattu Pongal day. This is one of the oldest living ancient tradition een in the modern era. It is held in the villages of Tamil Nadu as a part of the village festival. Bulls are bred specifically for the event and a specific breed of cattle bred for this purpose is known as "Jellicut"
Jallikattu has been coined from the term salli kācu (coins) and kattu (meaning a package) tied to the horns of the bulls as the prize money. In Sangam literature it is called ‘Yeru thazhuvuthal’ (means to embrace bulls). Ancient tradition : Jallikattu an ancient ritual it was a popular sport during the Tamil classical period. It was common among the ancient tribes who lived in the ‘Mullai’ geographical division of the ancient Tamil country. During the ritual a bundle of coins was tied to the bull’s horns and the bull tamer had to remove this bundle from the animal’s head to win gold or silver coins to be called ‘brave’ and ‘valourous’. The majority of jallikattu bulls belong to the pulikulam breed of cattle. Why Jallikattu should be banned ? Jallikattu violates the provisions of The Prevention of Cruelty to Animals Act, 1960; fundamental duty Article 51A (g): compassion towards animal; Article 21 (Right to Life), which prohibits any disturbance to the environment, including animals as it is considered essential for human life. Terrifying and injuring bulls is abuse, not sport, and this combined with the injuries and deaths of people common at Jallikattu events puts a bloody stain on India's reputation in the eyes of the world. In just four years, from 2010 to 2014, approximately 1,100 injuries to humans were reported by the media as a result of cruel and dangerous Jallikattu-type events and 17 people died, including a child. During Jallikattu, terrified bulls are often deliberately disoriented by being given substances like alcohol, having their tails twisted and bitten, being stabbed and jabbed by sickles, spears, knives or sticks and being punched, jumped on and dragged to the ground. During races, bulls are often hit with nail-studded sticks and pushed beyond the point of exhaustion.